Although some references indicate Durand Art Glass was founded by Victor Durand, Sr. in Vineland, New Jersey in 1924, this is only partially true. There was a company that produced glassware marked Durand in Vineland, but it was named Vineland Flint Glass Works and it came about in 1897. Victor Durand, Jr. worked with his father to found the company, which produced chemical and scientific glassware in its early years, according to the Wheaton Arts and Cultural Center in Millville, N.J. The Durands were originally from Baccarat, France where they worked for the world renowned Cristalleries de Baccarat before migrating to the United States in the late 1800s. They both honed their skills at a number of glass factories in the United States prior to opening Vineland Flint Glass Works, according to TheAntiquarian.com. Victor Durand, Jr. eventually bought his father’s share of the business, and the company thrived during the early 1900s as his business holdings grew. In fact, Vineland was considered to be one of the most successful companies in the country at that time. As a result, the founders’ dream of producing art glass was set into motion. Durand Art Glass Shop, a division of Vineland Flint Glass Works, was established in late 1924 with the help of Martin Bach, Jr. who had inherited the Quezal Art Glass and Decorating Company's formulas from his father. Unfortunately, Quezal was in distress financially when he took over as general manager subsequently closed leaving him available to consider Durand’s offer of employment. After accepting the challenge to head up this new art glass venture, Bach quickly rounded up several former Quezal workers to join him. Together they made up what was know around the company as the "fancy shop" producing elegant art glass that duplicated Quezal’s most popular designs. The group didn’t stop at imitating their prior work though. Transitional pieces combined Quezal influence with new techniques. But even though the fancy shop eventually produced wares distinctive to Durand, many Quezal influences lingered throughout the division’s production. It’s interesting to note that the art glass division of Vineland Flint Glass Works was never considered profitable. That’s not to say that the work of this division wasn’t recognized. Durand art glass received the Medal of Honor at the Sesquicentennial International Exposition in Philadelphia in 1926. But it was purely Victor Durand’s infatuation with the glass that kept the fancy shop going at the expense of other more lucrative products his businesses sold. This interestingly compares with Louis Comfort Tiffany who was also known to subsidize his company's artistic ventures with his personal fortune during this same period. Victor Durand tragically died in an automobile accident in 1931. Vineland Flint Glass Works was attempting to merge for a second time with another Vineland business, Kimble Glass Company, at that time. The merger was completed by Durand’s widow, and Kimble sold off most of the Durand’s inventory of art glass. The company made a line of bubbly glass similar to that produced by Steuben, but by the end of 1932 the fancy shop closed and all remaining stock was reportedly broken and discarded, much to the chagrin of today’s collectors. Yellow glass in varying hues was often employed by Durand. It was referenced as “oil glass” by the fancy shop’s employees, but the company called it “ambergris.” This yellow glass was considered imperative to produce distinctive colors in the company’s iridescent glass. This iridescence was referred to as "lustre". The iridescent lustre, called "Tiffany iridescent" by Durand, was made by mixing tin chloride with ferrum chloride with a water base. The blue and gold colorations of the lustre finish also resemble Steuben’s Aurene glass (see More Images above). One of the prolific designs produced by Durand was Peacock Feather (see photo above). This design was popularized by Tiffany first and also made by Quezal. These pieces were manufactured in both transparent and opaque colors. Durand used the term "flashed" for the transparent color on this type of piece produced in blue, green and ruby red along with yellow in more limited quantities, not to be confused with what collectors refer to as "flashed-on" color today. Beginning in 1925, Peacock Feather pieces were made in "cased" glass as well. These pieces were produced by layering glass colors and then cutting the colored layer(s) to reveal the clear glass beneath. This technique is commonly called "cut to clear" by collectors today. Durand, however, cataloged this style as "Cased Glass" and reproduced the technique in many patterns and colors. King Tut was another popular design Durand made in various forms. This whirling pattern can also be traced to Tiffany, and was made by Quezal as well. 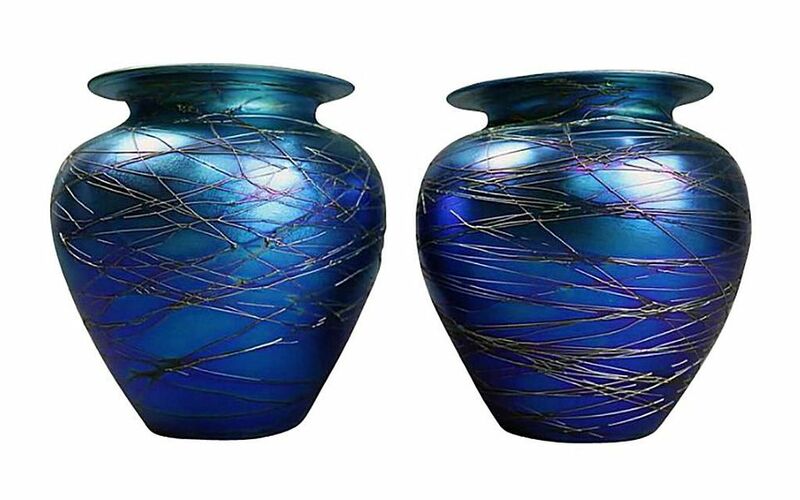 These pieces were made in a variety of colors with the lustre finish. Durand’s Crackle Glass was made in a two step process where hot glass was coated with layers of colored glass and then dipped into cold water so that the top layer would crack. The glass was reheated and then blown into a mold to shape it. A number of different names were used to describe the resulting color combinations with a lustre finish including Mutual, Moorish, and Egyptian. Crystal Crackle was also made with a threaded color over a clear base similar to Steuben’s threading pattern. Cameo and acid-cut-back pieces were also made by Durand, but in limited quantities. Other specialty items such as solid and hollow Bubble Balls were produced as lamps but were later collected as paperweights. Other lamps with varied base designs were also crafted of glass in the factory, and matching shades made of linen or parchment were commissioned to go match them. The shades usually deteriorated over time making complete lamps hard to find. Many Durand pieces were not signed, especially the early wares. They were marked with silver and black paper labels, which usually wore away over time leaving the pieces unmarked today. Larger pieces have polished pontils even when a mark is not present. These pieces are identified by the shapes, colors and decoration, including the iridescent ambergris interior finish of opaque bowls and vases. Later pieces were marked in several ways. Some had a hand incised marked reading only "Durand." Sometimes the brand was accompanied by a large "V" and numbers indicating the shape number and height of the piece. Most of these engraved marks were traced with an aluminum pencil giving the lettering a silver appearance.